Stunning footage has revealed a rare underwater volcano erupting off the coast of Taiwan. As the drone flies over the around Kueishantao Island, off the coast of Taiwan’s Gueishan Island, beautiful bubble plumes can be seen surfacing as volcanic vents erupt underwater. The video was captured by marine scientist Mario Lebrato, 29, from Spain. Mario, who works at the University of Kiel in Germany, said: ‘We were diving to obtain volcanic sulphur, [but] shot an aerial video to explore the area. ‘Being able to capture this on video is extremely rare. You need to have a yacht onsite, good ocean conditions, a permit and the exact GPS and if you want access by helicopter it costs more than $10,000 per hour, the only chance is to drone the area. ‘It is very difficult to find shallow volcanic vents of this colour and with these features, let alone film them. We were very lucky. ‘Historic accounts talk about the island splitting open with red lava. Nowadays the volcano shows active submarine vents, and more underwater volcanic activity. 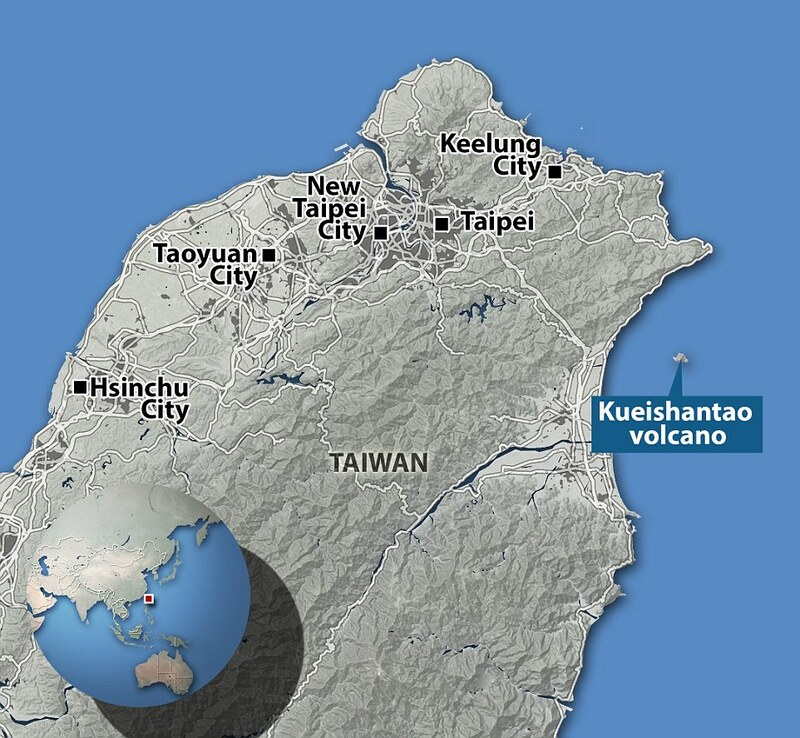 Kueishantao Island, reaches 1315ft (401m) above sea level at its peak, and is the southernmost of five small volcanic islands off the north-east coast of Taiwan. The island is also known as ‘Turtle Mountain Island’ thanks to its profile as seen from some points on mainland Taiwan. Historical accounts during the time of King Qianlong of the Qing Dynasty (1775-1795 AD) documented the Guieshan mountain splitting open with a blood-red lava flow. Today, Kueishantao displays vigorous active submarine fumaroles and solfataras that discolour seawater over wide areas. A fumarole is an opening in a planet’s crust, usually close to a volcano, which emits steam and gases such as carbon dioxide, sulphur dioxide, hydrogen chloride, and hydrogen sulphide. A solfataras is a volcanic vent emitting sulphurous gases and water vapour or sometimes hot mud. Mario captured the footage with Spanish film-maker Daniel Meana, 31, as they were working offshore on a research project with Taiwan Ocean University. Mario said: ‘In the video you can see more than 30 vents, which expel sulphur and carbon dioxide. ‘The seawater comes out of the vents at around 100°C (212°F), but then gets cooled down by the surrounding water.